My honey apple brandy glaze is the prefect mop for barbecue pork and you can have it made up in 15 minutes. This recipe was created in an instant when we had run out of apples and if the results are anything to go by we'll have to run out of apples more often! Today, as I write this recipe, it's a public holiday, I've got a lovely piece of pork that is perfect for smoking and my wife thought it would be nice to make some apple sauce. Just a minor problem............no apples! What else has apple flavouring? Cider! Calvados! Looking at the bottles I have available, this is going to be a Calvados glaze. Calvados is an apple brandy made in the Normandy area of France, it has beautiful apple flavours and the French use it extensively in cooking so why shouldn't we? I've kept my smoked pork loin recipe very simple and then used this honey apple brandy glaze to bring out the full apple flavor. Tip all the ingredients into a small saucepan and bring it up to the boil. Simmer gently for 5 minutes (this helps any bitterness from the alcohol to burn off) and stir gently, don't leave it during this time otherwise you'll end up with a blackened burned pan! After the 5 minutes, take the pan off the heat and allow it to cool so that you have a semi viscous glaze. Spoon / brush the glaze over your pork joint during the latter stages of your cook out. Every half hour for the last hour is good enough, you don't want to be doing it any more frequently than this otherwise you'll lose all the heat in your smoker when you lift the lid. Note: If you are preparing pulled pork then every time you add liquid to the surface of the pork, the temperature of your meat will drop slightly as energy (heat) is consumed to evaporate the liquid from the surface. This is another reason why I only add the glaze in the latter stages of the cook when I know that the core temperature of my pork is already up to 90°C (195°F) ie. ready for pulling. 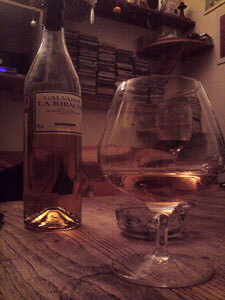 Special thanks to Sheriff Of Nothing for the Calvados photograph.